Louis H. Sullivan (1856-1924) is the architect that designed these cast iron and granite fragments of various size. They were acquired between 1952-56 with the aid of architecture alumni. The pieces now reside on the north side and in the entrance hall of the Architecture Building. Taken from their original context, these architectural fragments ought to be regarded as art, seen independently but with regard to their original function as part of a building's design. 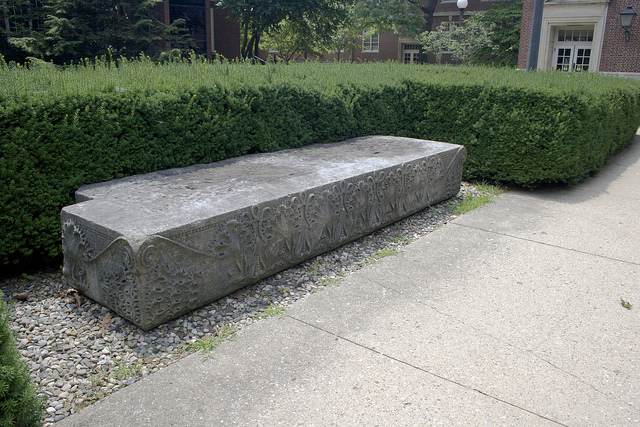 The heavy granite impost block just north of the Architecture Building is animated by exuberant, feathery plant forms and graceful comer scrolls that create lush, vivid linear surface patterns. Installed much as a bench and without identification or apparent reason, it imparts a vaguely romantic presence to the parklike setting. It originally supported the springing of two massive ground-floor arches of the Walker Warehouse, 200 South Market Street, Chicago, designed by Adler and Sullivan in 1888 and first known as the Ryerson Building. It was a structure that clearly reflected Henry Hobson Richardson's Marshall Field Wholesale Building of 1885-1887. When the Walker Warehouse was demolished in 1954 for the Wacker Drive extension, most of the building was used to construct a breakwater in Lake Michigan. Also characteristic of Sullivan's ornamental style are decorative panels displayed in the Architecture Building's entrance hall. They demonstrate his designs' kinship with contemporary Art Nouveau vocabulary-dynamic, undulating, delicate organic forms, freeflowing linear interplays of open and closed spaces, here tightly organized, symmetrical, and profusely intricate. As with Sullivan's other commissions, his chief draftsman, George G. Elmslie, worked out details of the design under the architect's supervision. The panels decorated the face of the Gage Building, 18 South Michigan Avenue, the northernmost of three buildings by Holabird and Roche that were erected diagonally across the street from the Art Institute of Chicago. Gage Brothers and Company was willing to pay an additional cost to have its building's facade designed by Sullivan. 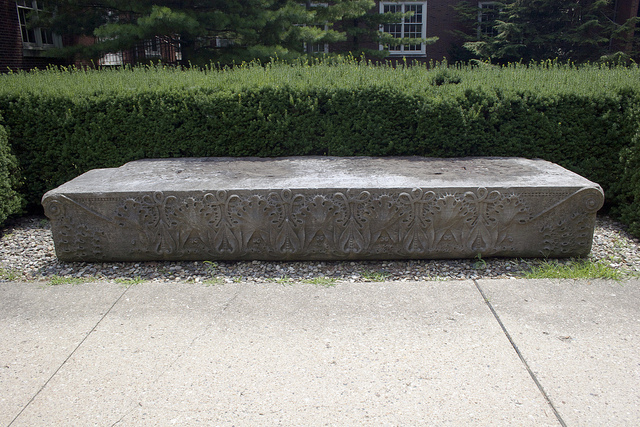 When in the 1950s the building was modernized and Sullivan's panels removed, university alumni arranged to have them given to the architecture department. Members restored the colors in accordance with William Gray Purcell's statement of Sullivan's specifications for the Carson, Pirie, Scott Building ironwork, a deliberate imitation of oxidized bronze achieved by allowing the red undercoat to show through in places: "Original finish was an honest paint job ... sharpened up with English vermillion. Finish coat with a certain juicy not too sharp green.... I'd say halfway between olive and sap.... Put this on in a medium coat, letting it settle well into the deep places. ... cover general surfaces-now swipe and pat the new paint with waste or handfuls of old newspapers so red will just barely show through here and there in high spots." Muriel Scheinman, “Architectural Fragments, 1888-1889 and 1898-1899,” ExploreCU, accessed April 21, 2019, https://explorecu.org/items/show/24.